I love being able to linger outside during the wee hours of the morning to watch meteorite showers in the sky over our hunting shack. Looks like I’ll have ample opportunity this year. Click here to see EarthSky’s Meteor Shower Guide for 2019. Watching the night sky always brings me a sense of peace along with a feeling of awe from the marvel of it all. So start planning a get-away out in the wilderness — away from the lights of the populated areas — where you can catch a glimpse of the 2019 meteorite showers. 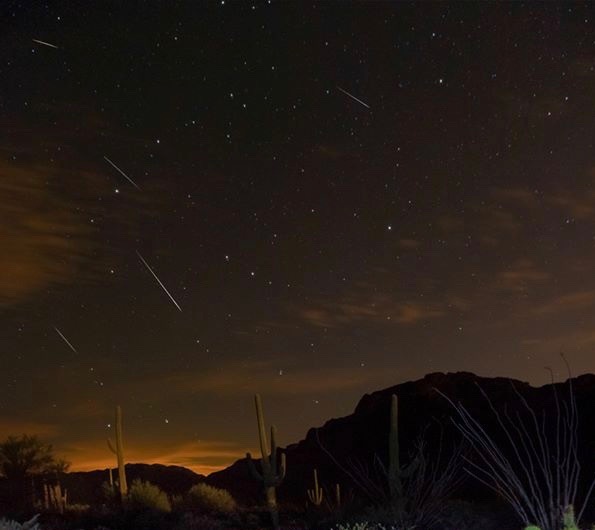 Draconids near Tucson, Arizona, in 2013. Photo by Sean Parker Photography. As EarthSky tells us, “remember … meteor showers are like fishing. You go, you enjoy nature … and sometimes you catch something.” Sounds like a good way to enhance one’s wellbeing! EarthSky derived the peak dates for their guideline from data published in the Observer’s Handbook by the Royal Astronomical Society of Canada and Guy Ottewell’s Astronomical Calendar. A meteor falling earthwards. The Draconid meteor shower during October 8, 2011 featured up to 1000 meteors falling per hour, according to some astronomers. Almost all meteors burn up and disintegrate. Video courtesy of NASA via Wikimedia Commons. January 20th has always been a special date for me. My first brother was born on January 20th, as was my maternal grandmother and one of my favorite cousins. But this year it will have an added specialness. There will be another Supermoon Eclipse. Yes, on January 20-21, there will be the first full moon of 2019, the first lunar eclipse of 2019 and the first supermoon of 2019. Making it even more special is the fact that this will be the last total lunar eclipse until May 26, 2021. Supermoon eclipse 2015. Photo by Alberto Varona Photography via Wikimedia Commons. Here are the eclipse times for the US and Canada. I’ve heard some TV personalities referring to this lunar eclipse as a Blood Moon. However, I don’t believe they are entirely correct in the use of the term. Most moons low in the sky appear reddish because the dispersed air between us on Earth and the moon makes the moon look reddish. But there is also a biblical prophecy called Blood Moon which is four eclipsed full moons (with a reddish appearance) in a row. This series of lunar eclipses is called a lunar tetrad. 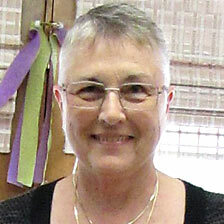 A lunar tetrad “describes four successive total lunar eclipses, with no partial lunar eclipses in between, each of which is separated from the other by six lunar months (six full moons).” (EarthSky) This phenomenon to Christians suggests the fulfillment of the end times as described in Joel 2:31. However, the last Blood Moon eclipse occurred in 2014-15 and we’re still here. The next will likely be in 2032-2033. So don’t forget to go outside this weekend to watch the Supermoon eclipse. For more information about the supermoon on January 20-21, go to EarthSky’s The supermoon eclipse of January 20-21. For more information about eclipse activity this year, go to EarthSky’s Dates of solar and lunar eclipses in 2019.